We quizlets disciplines. It means they will cope with your task without any difficulties in spite of the paper volume and deadline. Prompt delivery is among our key features in addition to flawless grammar, exceptional writing style and proper format with write my essay for me. Have your expert create for you a case-specific, resonating paper of any complexity. What are the order cut-off dates for guaranteed delivery by Valentine's Day 2017? What are the order cut-off dates for guaranteed delivery by Christmas 2016? When will you ship my gift book? After you place your order, we typically print and ship it out within 2 business days. Since our shipping carriers do not pick up on weekends, orders placed on Thursday, Friday, or Saturday are generally shipped out on Monday, regardless of the shipping method chosen. Once we ship your order, you are automatically sent an email confirming shipment. If you receive this email message after 4PM, or on a weekend, your order may not be postmarked until the next business day. After you place your order, we typically print and ship it out within 2-3 business days. After that, time in transit depends upon the shipping method you have selected. First Class Mail arrives in 2-7 business days (US 50 states). Note: First Class and Priority Mail shipping times are estimates and are not guaranteed. Shipping times of up to 10 business days (14 business days during holiday periods) can occur. If you absolutely need your order to arrive by a certain date, we recommend upgrading to the Express Mail option. Please allow additional time for delivery of orders shipped to Alaska, Hawaii, P.O. Boxes, military addresses (APO, FPO), or US territories (i.e. Guam, Puerto Rico). Datevitation books are manufactured in Los Angeles and shipped to Canada via the US Post Office. It has been our experience that the vast majority of books are delivered within 7-10 days of shipment with First Class International Mail (the more affordable $4.50 option). On rare occasions however, books get held up in the customs bottleneck and can take longer for delivery. As a result, we conservatively provide the 7-21 day estimate for First-Class International, even though it is highly likely you will receive the book within 7-10 days of shipment. If you absolutely need your book to arrive by a certain date, then we suggest you upgrade to Priority International which will arrive 7-10 business days from the date of shipment. How do packages appear when shipped? Your book will be shipped in a discrete envelope. There are no stickers or promotional slogans on the shipping envelope other than those of the carrier. Also our packing slips do not include dollar amounts, which is perfect if you plan to ship your book directly to the recipient. Do you ship to P.O. Boxes, U.S. Territories, or Military APO/FPO Addresses? Yes. Please allow additional time for orders shipped to these addresses. We currently only ship to (1) U.S. states, territories, military addresses; and (2) Canada. We apologize if you were looking to ship elsewhere, and we hope to expand our international shipping to other countries in the near future. However, our e-date platform is available worldwide. If you’d like to send a Datevitation e-Date to your sweetie today via email or Facebook, you can learn more here. Thank you! Some USPS products provide Tracking, while others provide only Delivery Confirmation™. It is important to understand the difference between “tracking” and “delivery confirmation”. First Class and Priority Mail – If you selected our standard shipping service via USPS First Class mail or upgraded to USPS Priority Mail, your package was shipped with Delivery Confirmation™. This means that when you check your order status you should see, at a minimum, when your order was delivered or when a delivery attempt occurred. USPS may also provide users with additional scan on items such as “processed”, “arrival at unit”, or “out for delivery.” However, the price of First Class and Priority Mail does not include end-to-end visibility. Express Mail® – This product include tracking that provides end-to-end visibility. This means that when you check your order status you should see, at a minimum, when your order was accepted and when it was delivered or a delivery attempt occurred. Additionally, you will likely see several additional scans as the item moves through the mail stream, such as “processed’ or “arrival at unit”. Do I have to add Faces to my book? No! If you prefer to not have photos of your actual faces in the book, you can use our default illustrated heads instead. How do I add Faces to my book? We have created a short video tutorial that shows you exactly how to upload and create a Face on Datevitation. We highly recommend you watch the video (embedded below), which should answer all your questions. If you have difficulty watching the video on this page, you can view it on youtube here. As you can see in the video above, creating a face on Datevitation is a simple 4-step process. Upload A Photo - The first step is to upload a photo. We give you the option to upload a photo from your computer or Facebook. Please be sure to follow our photo guidelines for best printing results. Position Face - The next step is to position the face. Drag the face into the provided hole and use the controls to your left to Zoom and Rotate the photo for the perfect fit. We also provide various jawline options for additional fine-tuning. Add A Hairstyle - The next step is to add a hairstyle. We offer a variety of colors and hair style options. If you prefer, you can opt against using a hairstyle in which case your face will appear as whatever you defined in Step 2. Save Face - The final step is to name and save the face to your account. What are the guidelines for selecting a photo that will lead to optimal printing results? (4) Nothing Is Covering the face. Don’t upload a picture that is very dark or washed out. Don’t upload a photo of a face that is only partially visible. Can I edit the faces I save to my account? Unfortunately not. Once you create and save a face, it cannot be edited. However, you can create as many Faces as you desire. If you do not like the first face you create, simply upload a new photo and try again until you get the desired result. Can I delete the faces I save to my account? Yes. If you log into your Account and go to the My Heads tab, then you will be able to delete faces. Is there an additional cost associated with adding photos? No! This awesome functionality is included in the price of the book. I am having difficulty adding Faces. It won't let me. Why? If you are having trouble adding faces, it is highly likely that you are using the Internet Explorer browser, which has compatibility issues with the HTML5 technology we use for the Faces Feature. Please switch to the Chrome, Firefox,or Safari browser to create your book, and you should not experience any issues adding and creating faces! I am a paying e-Date member, and I am no longer dating the person who has a free membership under my account. Can I invite someone else to redeem the free membership? Yes! Simply go to the “My Account” section, then the "e-Dates’ tab, then the “Membership” sub-tab. Once there, you will see a section at the bottom called “Free Partner Membership.” There, you can delete the former email associated with the free membership and then invite another person to enjoy the free membership. I paid for a e-Date membership, which includes a free membership for my date as well. How can my date access his/her free membership? When you send your first e-Date, the recipient will be prompted to sign up for his/her free membership upon opening your first e-Date. If the recipient signs up at that time, then the free membership will be redeemed and he or she can begin sending you unlimited e-Dates as well. If the recipient fails to sign up for the free membership upon receipt of the first e-Date, then you can always re-invite him or her by going to “My Account” > then the “e-Dates” tab > then the “Membership” subtab. At the bottom of the Membership page, there is a section entitled “Free Partner Membership.” There, you can enter the email of the person whom you wish to receive the free membership, and we’ll send an email to that address inviting him or her to sign up. If there is a 30-day free trial for the e-Date membership, why do you require my billing information? We need your billing information to reduce fraud, and verify you have a valid credit card should you keep your account open. This prevents any interruption of service. You won’t be billed unless you keep your account open past your 30-day free trial. To change your password, simply log-in to your account and enter your new password in the Account Basics section. Click on “Log-In” in the top-right corner of the homepage, and enter your email address and password to log-in to your account (you can also use your Facebook Log-In information). How do I track my book order? Once your order has shipped, your tracking information will be emailed to you. You can also track your order by logging into the My Account section. Go to the “Books” tab, then the “Order History” sub-tab, and then click on the order number to display the full order details. At the bottom of the page, there will be a link to the USPS tracking website, where you can enter your order number to find out the delivery status of the order. You can learn more about our shipping and tracking options here. How do I track my e-Dates? Once you send a e-Date, go to “My Account” then “E-Dates” and then “My E-Dates”. There, if you hit the “Track” button, you will see if and when your e-Date has been opened. Click on “Log-In” in the top-right corner of the homepage, and then click on the “Forgot Password” link and follow the instructions. We will email you a temporary password, which you can later customize in the Account Basics section. Where can I find book projects that I started working on and saved for later editing? Log-in to your account, then go to the “Books” Tab, and then the “My Projects” tab. There, you will find any projects that you have saved. Where can I find out information about my order? Once you log-in to your account, go to the “Order History” tab. There, you will be able to see the your order details, including your order number and status. If your status states “Processing,” it means that your order is newly received and has not been shipped. If your status states “Shipped,” then your order is currently being prepped for shipping or has already shipped. No. At this time we do not accept Cashier’s Checks or Money Orders. We are required by law to collect sales tax on orders shipped to California. If you are shipping to California, the appropriate charges will be added to your payment total and displayed on your final order confirmation. How much does a Datevitation e-Date membership cost? A Datevitation e-Date membership costs $1 per month per couple. Instead of charging your credit card $1 per month, to make billing easier we charge you $12 on an annual basis. How much does a Datevitation Gift Book cost? A Datevitation book starts at $25, which includes the cover of your choice, a personal message page, and 5 date activity pages. You can add more pages for $1 each (maximum of 20). Standard shipping is just $3.50. Expedited shipping is available at an additional cost. Yes! Our online payments are processed through PayPal – which uses the latest proprietary technology to ensure your transactions are safe. Your order is processed in a secure encrypted environment of Secure Sockets Layer (SSL) between you and PayPal directly and we are not informed of any of your credit card details. For further information, please visit www.PayPal.com. We currently accept Visa, MasterCard, Discover, and American Express for all orders. Debit cards (also known as bank cards) are accepted if they have a Visa or MasterCard logo. Do you sell or disclose my email or other personal information with third parties? Will you share the book I create with anyone? Absolutely not. We respect your privacy. We only print a single-copy of your book in order to prepare it for shipment and our employees are bound by strict privacy agreements that prohibit them from printing additional copies or otherwise sharing your book with anyone else. How do I cancel my 30-day free e-Date trial? How do I discontinue auto-renewal of my e-Date membership? What is your refund policy for books? At Datevitation, your satisfaction is our number one concern. If you’re not happy with your Datevitation Gift Book for any reason, we’ll provide you with a full replacement or give you a full refund. Please contact us to arrange a refund or replacement following the instructions below. To order a replacement Please contact us at support@datevitation.com with the order number and a description of the problem. Books with defects or shipping damage will be reprinted and reshipped at no charge. Quality is very important to us, so we may ask you to return your defective book for inspection. To get a refund Your book must be returned with a completed return form to be eligible for a refund. Please contact us at support@datevitation.com with your name and order number, and we’ll email you the return form with further instructions and our return address. Once we receive your returned book, your refund will be processed and automatically applied to your credit card or original method of payment within 7 days. Please note that depending on your credit card company, it may take an additional 2-10 business days after your credit is applied for it to post to your account. Shipping charges on the original order will be refunded if the entire order is returned, or if the return is necessary due to our error. We are unable to issue refunds for return shipping charges. Please allow two to four weeks once we receive your return for your refund to be processed. What is your refund policy for e-Date membership? Datevitation offers a free 30-day trial on e-date memberships. If you cancel your account within 30 days of your original signup, then you won’t be charged. After your 30-day free trial, you will be charged $12 annually on a recurring basis. Your membership will automatically be renewed at the end of your annual billing period unless you turn off the auto-renewal feature prior to the expiration date of your then existing billing cycle. If you turn off the auto-renewal feature, you won’t be charged again but you are responsible for whatever charges have already been incurred for the current billing period. For instance, if your annual billing cycle began June 18, 2012 and you discontinue auto-renewal on June 24, 2012, you’ll still have to pay the annual subscription fee, but you won’t be charged again after that. If you intended but forgot to cancel or discontinue your membership and have been charged, please submit a support request or email us at support@datevitation.com and we will do our best to accomodate your request for a refund if it is made within 1 month of the charge appearing on your statement. I updated my browser, and I am still having problems? What can I do? If you updated your browser, and still are having problems, then try clearing your cache and cookies. You can do this by following the instructions related to the browser below. Firefox 3.5 and above 1. From the Tools menu, select Clear Recent History… . 2. From the Time range to clear: drop-down menu, select the desired range; to clear your entire cache, select Everything. 3. Click the down arrow next to “Details” to choose what history elements to clear (e.g., check Cookies to clear cookies). Click Clear Now. Back to top Chrome 1. From the Chrome menu, select Clear Browsing Data. 2. Select the items you want to clear (e.g., Empty the cache, Delete cookies and other site data). 3. You can choose the period of time for which you want to clear cached information from the Clear data from this period drop-down menu. To clear your entire cache, select Everything. 4. Click Clear browsing data. Internet Explorer 8 and above 1. From the Safety menu in the upper right, click Delete Browsing History… . 2. Deselect Preserve Favorites website data, and select Temporary Internet files, Cookies, and History. 3. Click Delete. Safari 1. From the Safari menu, select Reset Safari… . 2. From the menu, select the items you want to reset, and then click Reset. Mobile Safari for iPhone OS (iPhone, iPod Touch, iPad) 1. From the home screen, tap Settings, and then tap Safari. 2. At the bottom of Safari’s settings screen, tap the buttons for Clear Cookies and Clear Cache. To confirm, tap Clear Cookies or Clear Cache again. Its simple to upgrade to the most recent version of your browser. Just visit the website of the browser you’re currently using (links are provided below), and then download the most recent version of the browser that’s available. You’ll then be prompted with instructions on how to install and use the new browser. Google Chrome Firefox Safari Internet Explorer Once you’ve upgraded your browser, return to Datevitation. Now that you have a newer version of your browser you should be able to enjoy the site without any problems, as well as the new features we roll out in the coming months. I have updated my browser and cleared my cache/cookies, and am still having problems. What do I do? If you are still having problems, then please contact us by email at support@datevitation.com Let us know what issue you are experiencing, and we’ll be in touch ASAP to be of assistance. I tried making a book but I have run into a lot of bugs and can’t get through the process? What can I do to fix these bugs? If you are experiencing technical problems, it is likely because you are using an old browser. We have done extensive testing on the most recent versions of Safari, Chrome, Firefox, and Internet Explorer, and the site has performed well. We have experienced some issues with older versions of browsers, especially Internet Explorer. If you update to the latest version of your browser (which is a good idea regardless as it will generally improve your browsing experience on all websites), your issues should disappear. What kind of paper is the book printed on? Our books are printed on professional-quality, heavy-weight cover paper. Specifically, the cover of the book is printed on 80 pound cover. The interior pages of the book are printed on 60 pound cover. Is it possible to buy individual love coupons, as opposed to buying them in a book? While we don’t offer an option to buy love coupons individually on our website, all of the pages in the book are perforated near the spine. As such, you can buy them in book form, simply tear them out along the perforation and, voila, you have individual love coupons! That is entirely up to you! The design process is super simple and easy, and is set up so that you can finish your book in as little as 10 minutes. However, you can choose to spend as much time as you like browsing our library of date illustrations and customizing the text for your gift book. 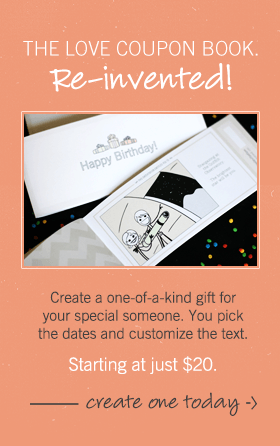 How do I create a Datevitation Gift Book? Our user-friendly design interface takes you through the process. First, you’ll choose a cover from a variety of options. Second, you’ll choose your love coupons from our vast library of ideas and activities. Third, you’ll be able to arrange the order of the pages and customize the accompanying text to your liking. You can also add a personal greeting which will appear in your book as the first page after the cover. And of course, we let you preview your entire book before you purchase. Does my book come ready-to-gift? Yes. Your book comes ready-to-gift in an eco-friendly (and beautiful) kraft string-and-button envelope. Do you offer hard covers? No. For the time being, our covers are printed on heavy weight linen paper (80#). Our interior pages are printed on 60# cover paper. Can I work on several different Datevitation Gift Books at the same time? Absolutely. At the beginning of the book design process, we ask you to title your project. Your project will be saved and can be accessed in the “My Account” section. You can create as many books as your heart desires. Can I cancel my book order? If you need to cancel your order, please contact us immediately by clicking “Contact Us” on the right side of this page. We will do everything we can to cancel your order before it has been printed. Once we have printed your order, unfortunately we cannot cancel it. After I complete my book, how long does it take for you to print and ship my book? After you place your order, we typically print and ship it out within 2-3 business days.